Although you may already have a certain amount of traditional life insurance coverage, there could still be certain expenses that you are overlooking that could put your loved ones in financial hardship should the unexpected occur, or when the time of your passing occurs. Today, final expenses - one's funeral and other related costs - could reach, or even exceed, $10,000. This is the case when factoring in items such as the funeral service itself, along with a burial plot, headstone, flowers, transportation, and obituary announcements. 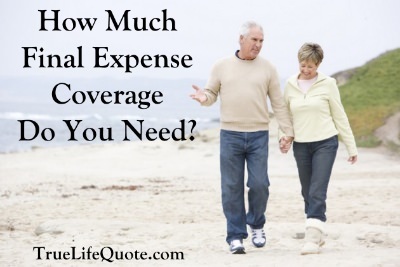 This is why, in additional to regular life insurance, many people will also carry final expense coverage. What is Final Expense Insurance and How Does It Work? Final expense insurance is a type of life insurance that is purchased for the purpose of quickly paying off final expenses. Because of this, this type of coverage is also often referred to as final expense or funeral insurance. These policies are usually purchased by individuals who are between the ages of 50 and 80 years old - although there are some insurance carriers that will offer policies to those who are in the older age ranges. With a final expense insurance policy, your named beneficiary can quickly receive a set amount of benefit - usually between $5,000 and $50,000 - for the payment of final expenses. And, just like with other types of life insurance, the proceeds from these policies are typically received income tax-free. As an alternative to having the benefit paid out to a family member or other loved one, some final expense insurance policies can instead be paid out directly to a named funeral home. This can make the payment of final expenses quick and convenient, allowing loved ones to focus on other things during their time of grief. When considering the purchase of a life insurance plan, one of the key decisions that you will need to make is determining how much coverage will be enough. In doing so, you will want to ensure that you leave your loved ones with enough proceeds from the policy to pay off your final expenses. Therefore, getting accurate figures on how much a funeral and burial in the area of your final resting place will be is very important. With this in mind, making calls to several different funeral homes in the area can help you to come up with an appropriate numerical figure. You should also be sure to include all of the other related costs, too, such as the memorial service, transportation, and additional items that will be included. In some cases, final expense insurance policyholders may also add in an additional amount of coverage for costs such as potential final uninsured medical and / or hospice expenses that loved ones could be responsible for paying. Doing so can help to provide a financial "cushion" for your loved ones, just in case. The premium cost of a final expense insurance policy will be dependent on a number of different factors. These will include the type and the amount of the coverage that you end up purchasing. Other criteria that are factored into the premium cost will include your age at the time of purchase, as well as your overall health condition. In many cases, there is no medical exam that is needed in order to qualify. However, those who are in very poor health could have difficulty qualifying for insurance. In addition, the insurance carrier that you purchase your policy from can also make a difference in the price that you pay. What many insurance purchasers do not realize is that the price of life insurance can differ a great deal from one insurance carrier to another - even on an identical policy that provides the same amount of insurance coverage. This is why it is important to do some comparison shopping before making your final determination on the coverage that you ultimately purchase. Deciding on the right amount of final expense coverage is important, as you don't want to leave your loved ones with large bills upon your passing. With the high cost of a funeral and related expenses today, not having this type of insurance could put your loved ones into a real financial bind without some protection. The good news is that you have many options available to you - even if you are not in ideal health. There are a number of different carriers that offer final expense coverage - and we can help you in determining which carrier, and what amount of final expense coverage, will be right for you. We work with many of the best final expense life insurance carriers in the marketplace today - and we can assist you in coming up with the coverage and the premium quote that will work the best in your specific situation. So, when you are ready to move forward, all you have to do is just fill out the form on this page to receive your initial quotes. If you should find that you still have any questions regarding how to determine the proper amount of final expense life insurance coverage - or even if you just have a quick questions about life insurance in general - our experts are here to assist you. Please feel free to call us. We can be reached directly via phone, toll-free, by calling 877-235-9299. We understand that deciding on the right amount of coverage can seem to be a bit tricky. You want to ensure that you have enough coverage, so that loved ones aren't in a financial bind - yet, at the same time, you want to be sure that you keep the premium affordable. The good news is that we can help you to find the option that will work the best for all of your specific needs. So, contact us today - we're here to help.